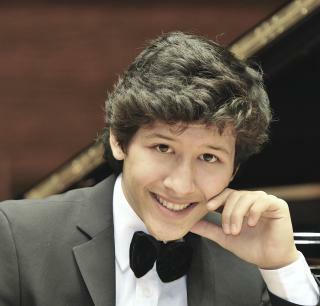 Born in 1996 in Tashkent, Uzbekistan, Nuron Mukumiy started his piano lessons at the age of 6 at the Uspensky Institute of Music in 2002 in the class of the renowned Tashkent piano pedagogue Prof. Tamara Popovich. While still in Uzbekistan, Nuron became a winner of several international competitions: The International Russian Music Competition in San Jose, CA. 2003, The Uzbekistan Republic Junior competition in Tashkent, 2004, and a Special Prizewinner of the Cantu International Piano Competition in 2005. Further successes came as offers of full scholarship in three major music institutions of London: The Guildhall School, The Purcell School and the North London Piano School, of which Nuron selected The Purcell School. n the years of 2007-2010 Nuron, as a student at the Purcell School, is invited to perform several times in the St. Martin’s-in-the-fields, Millenium Center, Steinway Hall and Royal Academy Hall in London. In the same year Nuron wins the 1st Prize and a Special Prize in the “Mozart International Piano Competition” in Rome and is offered a distinguished opportunity to conduct the “Moscow Virtuosi” at the international Festival of “Vladimir Spivakov”. Further competition recognitions follow in years 2008/9, when Nuron wins the 1st Prize in the International Competition of Modern Music in Switzerland and the 2nd Prize in the International Franz Liszt Competition in Weimar. Next year, in 2010 Nuron is accepted as a Young-Student in the Hochschule für Musik Frankfurt in the world renowned “Meisterklasse Prof. Lev Natochenny” and moves to Frankfurt, Germany.